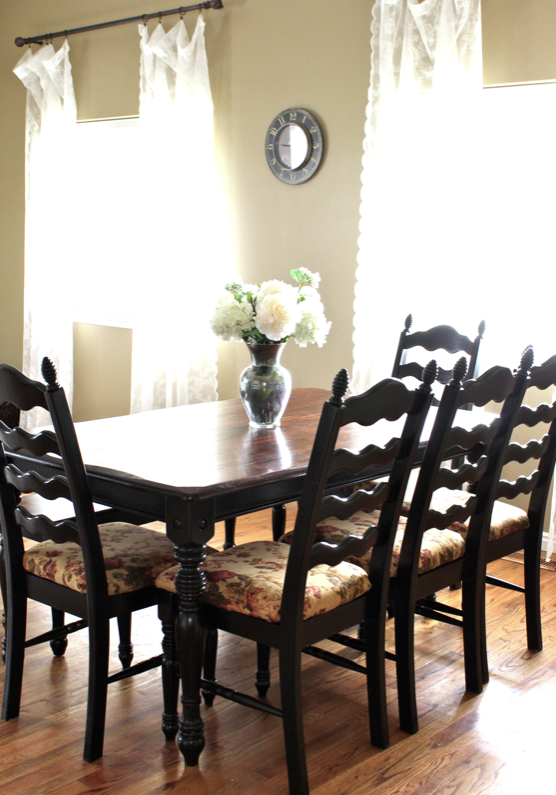 Remember THIS tutorial where I transformed my kitchen table? Well, I almost did it perfectly... After time the top, where I stained the table, began to fade and the black paint started to chip away. The reason this happened was the fact that I didn't seal off the paint and stain with a clear protective finish. This was one of my first ever DIY projects, but really.... WHAT THE HECK WAS I THINKING?! I wasn't thinking... We live and learn, right? 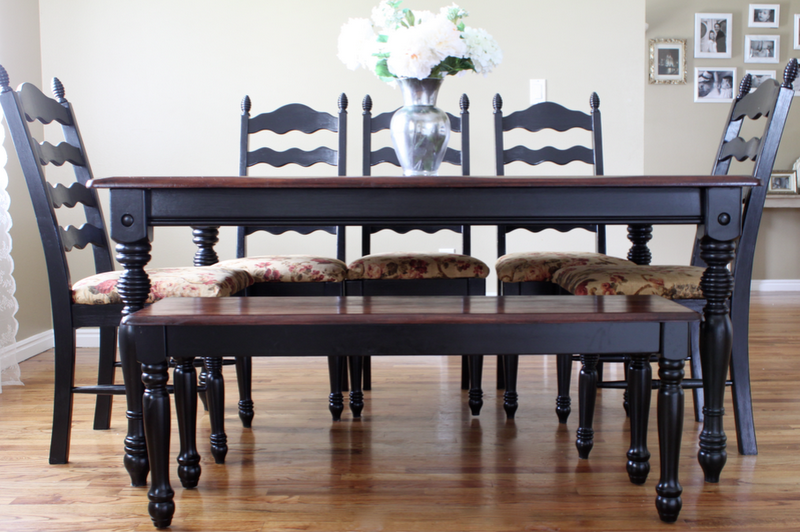 To fix this problem I simply used a little black touch up paint on the chairs and legs of the table. 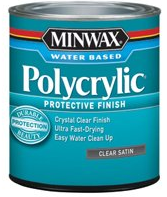 Once the paint dried, and I was happy with the look I used this lovely product to seal the job. Now my table is safe from everyday use and paint chipping is history. 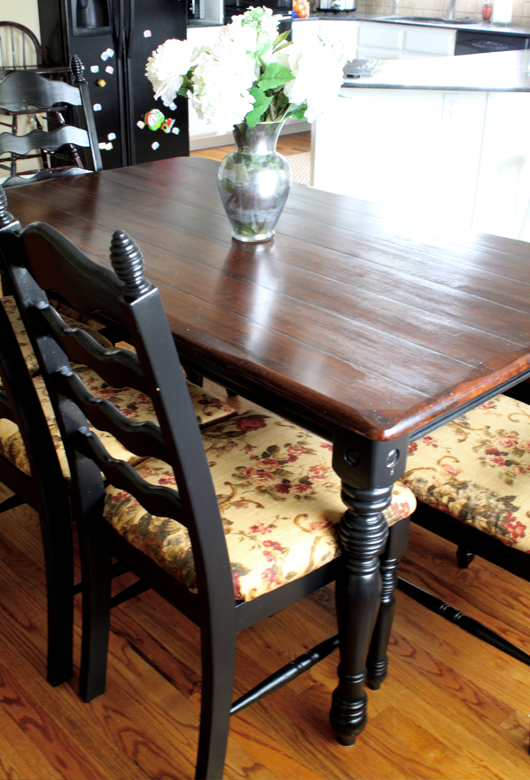 As for the top I had to go through the entire process of sanding, cleaning, staining, and sealing. This time though I decided to fill in the crumb catching crevices on the table with wood filler. Do you see what I am talking about in the picture below?? Each horizontal line on this table was actually a small dip in the wood. They were nearly impossible to clean and drove me CraZy mad. I used this product to solve the crumb catching problem. I simply followed the directions on the label. When in came to sand the table down I made sure that the wood filler was perfectly level to the existing tabletop. I then followed all of the directions from THIS tutorial to finish my table top adding a couple steps I will talk about in just a sec. 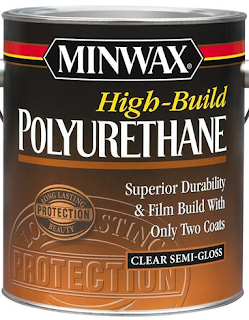 Once I completed the directions from the before mentioned tutorial I made sure to use this product to finish it off. 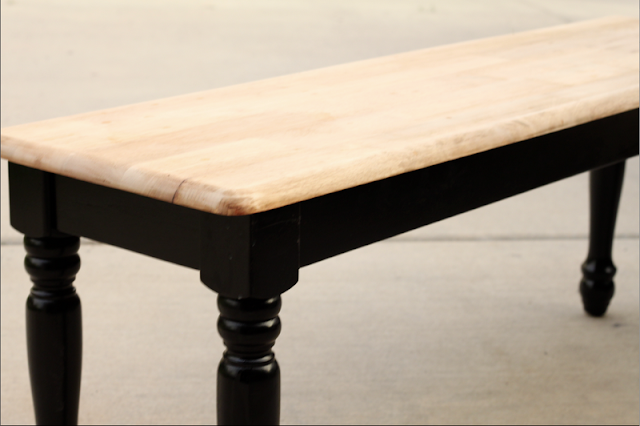 Finally I wanted to add a bench into this table equation. I found one at good ole' Walmart that would do the job. The Black legs were a perfect match, but the wooden top just didn't go. I decided to take matters into my own hands and make it match. The process of refinishing the bench I bought a Walmart is as follows. 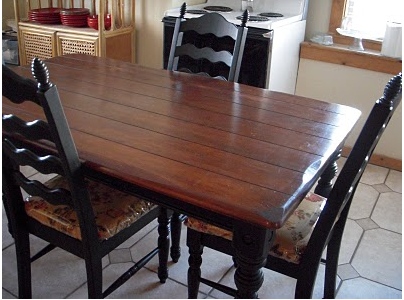 This is the same EXACT process that I did to refinish my table top. This is the RIGHT way! Here is the "before" picture of the bench. Here are the products I used for this job, lined up in the exact order I used them. The above steps allow you to get down to the natural wood. 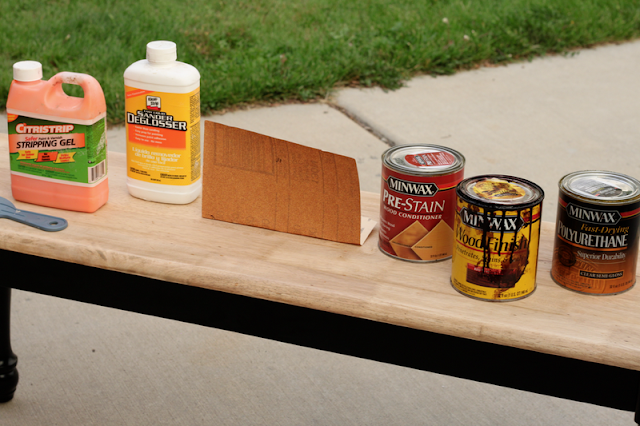 This will help the stain to apply evenly and effortlessly. See how bare this wood is compared to the Walmart Picture. 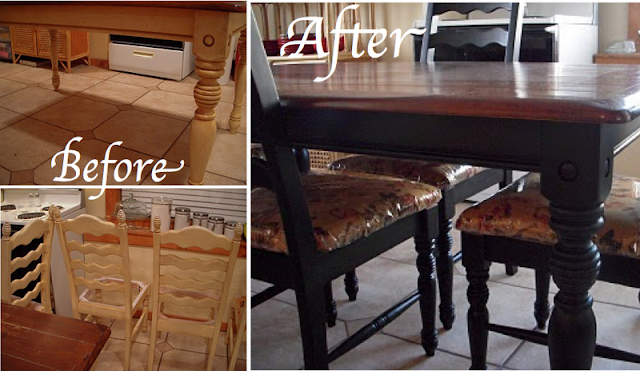 This is how you want your wood to look before you begin the next three steps in the transformation process. Be sure to follow the directions of the labels of each product to ensure the best results. After a couple of days my table was as good as new. 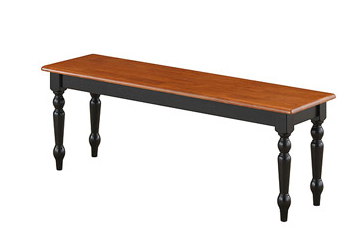 Doesn't that bench look like it was totally made for that table? It looks like a complete set! I just love finding stuff and making it mine!!!! Yay, for a good DIY project! What a difference! We have a table that I need to get some wood filler for because it is impossible to get all the crumbs out of it too. Love the stain color.